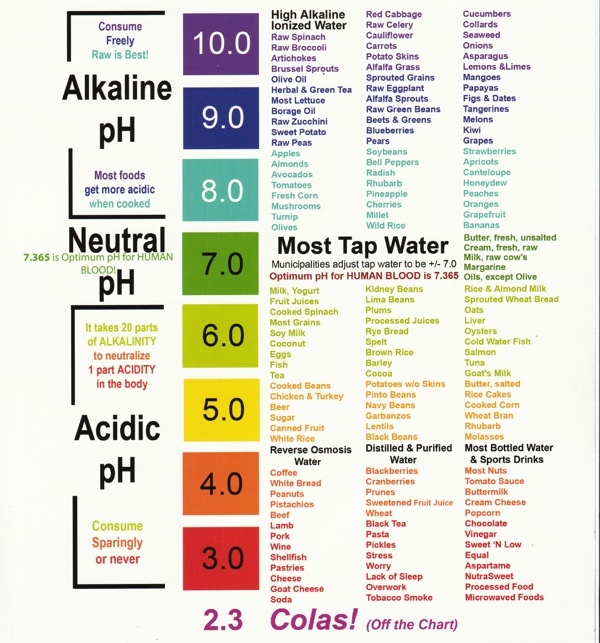 All of our bodies have a pH level that determines the amount of acidity and alkalinity present in our system (pH balance refers to the levels in our body fluids and tissues). The acidity of foods, beverages, herbs, and spices are measured on a 14 point scale, zero being the highest amount of acidity, fourteen being the lowest, or alkaline. Originally, alkaline is the body’s natural and pure state. However, many factors in today’s society contribute to an over acidic environment. These factors range from the abundance of processed foods, the overuse of antibiotics, the natural process of aging, and even stress. It is important for us to assist our body in creating and maintaining a healthy pH ratio of 70:30, alkaline to acid. Most diseases, illnesses, and bad bacteria thrive in an over acidic environment. When pH levels are unbalanced, it is mostly in the case of being too acidic. This causes the body to borrow crucial minerals from organs, bones, and tissue to try and neutralize the acid and remove it from the body. Over acidity weakens all systems and can be seen in acute symptoms such as yeast/fungi overgrowth (candida among others), chronic fatigue, slow elimination, hormonal concerns, premature aging, free radical damage (may lead to cancerous mutations), weight gain, bladder and kidney damage such as kidney stones, diabetes, joint pain, and lactic acid build up. Luckily for most of us, it is not too late to take measures and start making lifestyle changes to reduce the amount of acidity and create and maintain healthy pH levels. Even if we have a healthy ratio right now, it is just as important to maintain it through proper diet and lifestyle. Remember, preventative medicine is the best cure for all diseases! The first step begins with diet. Below is a list of the levels of alkaline/acid foods. When in doubt about basic acid/alkaline properties of food remember that most vegetables, fruits, and herbs are alkaline forming. The most acidic foods (should be avoided) are processed flours and sugars, most dairy, soda, sugars, coffee, alcohol and harmful external toxins such as tobacco and over the counter medicine and drugs. Refer to the charts below and use them as basic dietary guidelines. Happy New Year friends! I hope everyone is doing great and enjoyed the holidays. You may have heard Vincera Institute’s team has come together for Re-New Week through January 13-17. If you are like a majority of us, the overindulgence of the holidays has left you dragging. You may be feeling bloated, tired, irritable, you may even be experiencing indigestion and digestive disruption. The Happy Re-new Year cleanse will focus on restoring healthy gut flora and balancing pH levels to help rid these discomforts. Our digestive systems are often disrupted during the holidays from all of the over-indulging in rich food, alcohol, and even from being off of our normal routine. Thus we create an acidic environment, which more than likely has an overgrowth of ‘bad’ bacteria. When there is not enough of the good bacteria unpleasant symptoms and health issues occur such as constipation, bloat, excess belly fat, moodiness, hormonal imbalances, candida, allergies, and many more. I will be creating fresh smoothies/juices daily that will contain healthy probiotics and supplements such as L-Glutamine to repair and regulate your digestive system, restoring the good bacteria needed to heal. 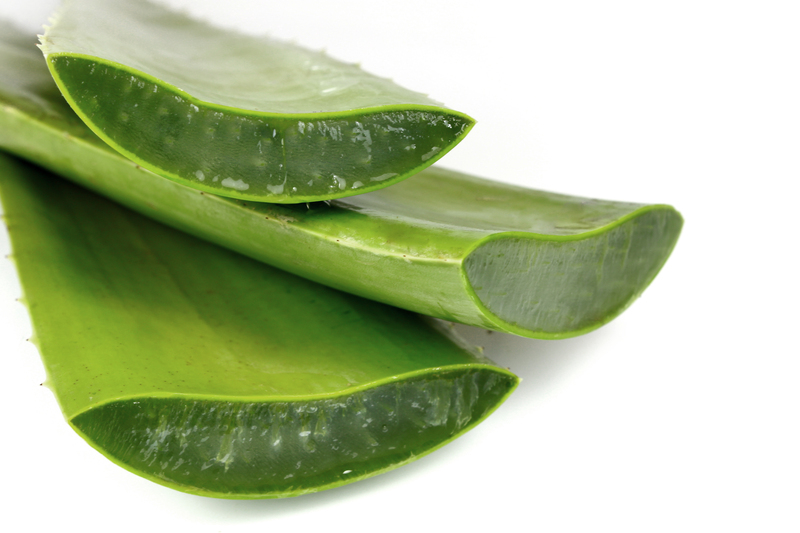 They will help with bloat, acidity, inflammation, constipation, and the rebuilding a healthy flora. We will work together on creating an environment that will promote healthy digestion and overall health. I’ll be giving daily tips and suggestions on supplements and foods to incorporate to maintain a healthy gut and pH levels. We will also focus on balancing pH levels by introducing more alkalizing foods and supplements. I will guide you in neutralizing the highly acidic environment caused from rich foods, sugars, alcohol consumption, stress, and/or simply from going off of your daily eating rituals during the hectic holiday season. 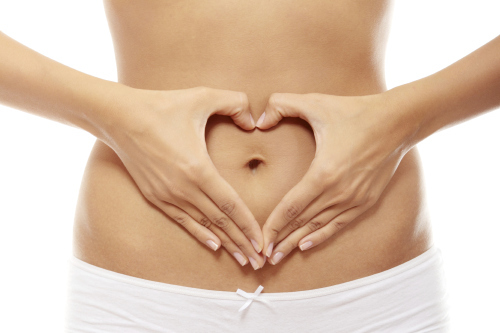 Many people underestimate the importance of a healthy digestive system and stomach flora. Not only is it crucial for nutrient absorption and proper waste elimination, but did you know that 80% of your immune system is located in your gut? It is only when we have healthy digestion that we can experience optimal health and vitality, physically and mentally. Vincera has amazing offers and events going on, from yoga to acupuncture to massage therapy. Learn more details here. Join me for a week of restorative smoothies and guidance for a healthy gut and digestive system. Get that belly back in shape, gain energy, and nix those mood swings and irritability. Details: $45 a person. 1 restorative smoothie a day for 5 days. Sign up via email or in person at The Galley. Please let me know in advance if you will be picking up smoothie in am/pm. It is just as important to properly prepare your body for a cleanse, as it is for the cleansing process itself. In order to avoid or reduce some of the not-so-pleasant side effects and to ease your body into a natural cleanse, follow some of the steps below. There are some practices you want to introduce to your daily routine a few days before you begin a detox. In addition, there are foods to start eliminating in order to tremendously enhance the overall cleanse. First, you want to start your mornings with a warm glass of water with freshly squeezed lemon. This simple practice is very powerful. The citric acid from the lemon juice helps to get the enzymes functioning, stimulating the liver, which helps the detoxifying process. It is also helps to restore hydration, while flushing out the kidneys. 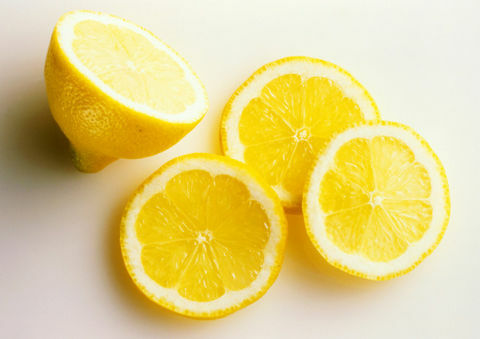 Lemons also contain Vitamin C, which helps to boost the immune system. I know this may be hard, but because we are going to be nixing the caffeine next week, try to ween yourself off of it this weekend. Instead enjoy a cup of herbal tea in the morning or have some fresh green juice or smoothie. You will be surprised at the amount of energy you gain from the nutrients from the juice, which are instantly absorbed into the blood stream. You may not even miss that cup of coffee when you experience the natural and steady energy all morning long. Not to mention your mood will be more stable and you won’t experience that “crash” you tend to get when the effects of caffeine wear off. You also want to try and abstain from alcohol this weekend, as well as processed foods, meat, and sugar. If these take up a large percentage of your weekend habits and/or indulgences, try to tremendously cut back this weekend. It will make the process much smoother next week and you won’t be going cold turkey right away. This way, your body won’t be too shocked come Monday. Aside from the diet adjustments, you want to prepare yourself mentally. Get as much relaxation you can this weekend, with moderate exercise and adequate amounts of sleep. Think about what else you want to achieve from this cleanse. Maybe journal or write down your thoughts to clean out your mind. Sometimes just writing your thoughts on paper helps restore mindfulness, allowing space for positivity and clarity. The third way to prepare for your cleanse is by organizing and planning your week. Get rid of all the junk in your pantry and fridge – making room for the good stuff. Think of this as your kitchen cleanse! This way you won’t be tempted next week to only have one cookie or chip… we all know what that can lead to. Stock up for your cleanse with whole foods, mainly only shopping the perimeter of the grocery store or by going to your local farmers market. Fill your bags with fresh produce (loads of veggies and greens), raw nuts (except peanuts), unsweetened rice or almond milk, cold pressed oils (think coconut, olive and sesame), herbal teas, plant-based protein powders, and whatever else you wish that is on our approved list or that you will be incorporating in our cleanse. Plan out your meals throughout the week and have healthy snacks on hand. I’ll be posting yummy and easy recipe ideas next week, so check back! Lastly, don’t stress over preparing yourself or for the actual detox. The idea is to feel good, practice mindfulness, restore balance, and build your immune system. Don’t forget to sign up at Nava Yoga Center! Joining a group detox will not only keep you motivated and committed, it will also provide you with the support and guidance from your peers and mentors. Enjoy your weekend and get ready to soon be looking and feeling radiant!